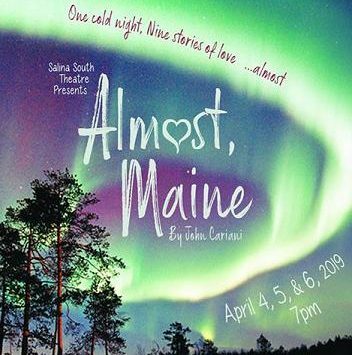 Salina South’s Theatre Department will present the play Almost, Maine on April 4, 5, and 6 at 7pm on South High’s stage. Almost, Maine is a place that’s so far north, it’s almost not in the United States. It’s almost Canada. And it’s not quite a town, because its residents never got around to getting organized. So it almost doesn’t exist. One cold, clear, winter night, as the northern lights hover in the star-filled sky above, the residents of Almost, Maine, find themselves falling in and out of love in unexpected and hilarious ways. Relationships end, begin, or change beyond recognition as strangers become friends, friends become lovers, and lovers turn into strangers in this delightful midwinter night’s dream. Almost, Maine is a series of loosely connected tales about love, each with a compelling couple at its center and each with its own charm. 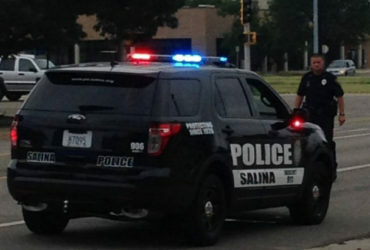 Cast members include Jonah Winsky, Kateryna Svertilova, Amaya Dungan, Santiago Vasquez, Allison Hull, Dawson Jamison, Madison Wilson-Snook, Lauren Zimmerman, Nathan Streeter, Ashley Carraway, Seth Carter, Maisy Lowers, Holly Johnson, Cameron Post, Ryan Graff, Haley White, Zach Swanson, Whitney Turner, and Jacob Sweet. Kate Lindsay is the director, with set design by Roger Coberly. Casey Grennan, Kaydence Dickson, and Alivia Heard are stage managers. Crew chiefs include Ryan Graff, Taylor Davison, Courtney White, Cameron Post, Whitney Turner, Alivia Heard, Mia Dennett, Andrew Lagerman, and Maisy Lowers. Ticket prices are $8.00 for adults, $6.00 for Senior Citizens/Military, and $5.00 for students. Tickets available in advance at South High School or at the door 30 minutes prior to performances. Limited seating for each performance. The production is presented with audience seated on stage. Parking accessible from both Magnolia Rd. and Edward St.